Background: Goebbels gave a speech every year on the eve of Hitlerâ€™s birthday. The 1943 speech came a few months after the defeat at Stalingrad, at a time when Germanyâ€™s prospects were looking increasingly uncertain. 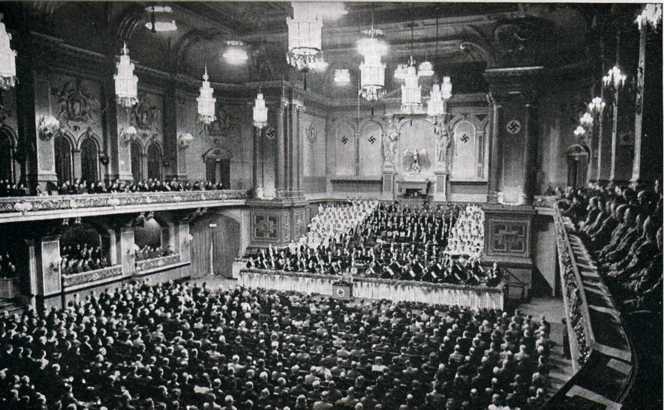 Unlike previous speeches, which usually focused more on Hitler personally, this speech took on the grim war situation at some length before turning to Hitler himself. German morale reports found that people took Goebbels speech as evidence that the war situation was serious, and that its end was nowhere in sight. The source: The German text of the speech is available in any German newspaper of 20 April 1943. Helmut Heiber also includes the text in his two-volume Goebbels Reden, based on a tape of the speech. His version is a more accurate text of what Goebbels actually said (some minor modifications were made in the printed version I use). The German people celebrate the Führerâ€™s birthday this year in a particularly somber manner. This fourth year of the war has been the hardest yet, and an escape from its burdens and sorrows, or its end, is nowhere in sight. Its enormous political and military events span all five continents. Wherever one looks, peoples and nations are affected by its pains and sacrifices. Hardly a nation has been spared the grave political and economic impacts of this vast military drama. Here and there critics of weak nerve and character, usually from those nations least impacted by the war, question whether human culture and civilization will be able to survive the war at all, and make worried calculations as to what part of humanityâ€™s proud inheritance will remain once the war is over. In the midst of the trials and burdens of the moment, it is all too easy to forget that this war, in contrast to those of the past, has a thoroughly national or racial character. That is why both sides fight with such bitter determination. The participant peoples know that this time it is not a matter of a more or less significant change in national boundaries, but rather a matter of national survival. A small event has had world-wide effects. But it would be false to see the real cause in that event. Back then our opponents had a thousand chances to meet our just demands without in the least harming their own power, image, or prestige. The enemy did not want it that way. They wanted war because as the English prime minister said as early as 1936, Germany had become too strong. Now and again we must remind ourselves to look back on the start of this war to understand its progress to the present state. A hypocritical enemy propaganda is constantly at work to conceal the warâ€™s true causes, to make people forget the liberal-democratic phrases of yesterday and accept the seductive ones of today, to make the guilty seem innocent and the innocent seem the cause of this great misfortune. We need only to recall the Führerâ€™s many unfortunately unsuccessful attempts to prevent this war by limiting armaments to a rational level. He made every conceivable effort to prevent the clash of nations that he foresaw. And how often he has tried to end this war at the earliest possible moment. It was all in vain. The wicked forces that wanted this war cynically and frivolously desired, and still desire, all-out war. What are the misery and misfortune of the worldâ€™s peoples, their own included, to them? They want only their personal enrichment and unlimited power over all the nations and continents. They did not come from the people, as we did. They therefore will never understand the real needs of their people. Their brutal cynicism, the result of their alien, indeed their perfidious attitudes, causes them to passionately hate the National Socialist peopleâ€™s movement and the National Socialist German people and nation, and above all the Führer himself. They see him as a newcomer to the business of leadership, which to them always means the betrayal of the people under the rule of money. Just as the enemyâ€™s hated world is personified for us by certain men, so, too, certain men personify the world we love and defend. By the nature of such an enormous war, he who leads it gives it its mark. And not only that. Just as he feels its good fortune and successes with double or triple depth, so too he feels two or three times as deeply the misfortunes of grim fate. Naive people may imagine that leadership in times of peace is easy and pleasant, but even they sense that in war, with the heavy responsibilities it brings, those at the bottom who need only follow orders have it much easier than those at the top who must give the orders. They are the Atlases who bear the world on their shoulders. Every great figure in history has at times been filled with the intoxicating feeling of holding, like God, the fate of the nations in his hands. Much more common, however, are long hours of bitter and passionate struggles for historical responsibility, of silent and desperate battles with forces that sometimes seem superhuman, of struggles against an unjust and hard fate which sometimes brings to ruin carefully made plans and destroys hopes that once seemed near. It is easy to speak and write about the beginning or the end of military crises. Only he is in the position to judge who has himself faced a crisis with only the strength of his own strong heart. Long days and long nights over weeks and months leave their unmistakable marks on his face. The sorrow and pain of individual people pile up around him as a mountain of sorrows and pain of the entire people. While the normal individual must master only his own fate, however difficult it may be, the Führer bears the fate of the entire nation. During critical moments, millions of eyes look toward him. They gain consolation and hope from his face, from the firmness of his manner, from the certainty of his gestures, from the confidence of his appearance. People often say that the Führer is the image of the German people. That is true in a way deeper than we often think. If one could watch the face of our nation change during this war, we would see the same transformation that we see with serious pride in the face of the Führer. The lines, the hardness, the decisiveness, but also the deep passion for the people and, in a broader sense for a humanity forced into so much bitter difficulty against his will and plans, are unmistakable. How cynical in contrast are the stupid and frivolous grins of the current leader of Britain during his public appearances. One hardly has to ask which of these two enjoys war, and who therefore wanted and provoked it. The face of the guilty one betrays him. Despite all their shouting, our enemies have not been able to weaken the magic force of the Führerâ€™s personality. It grows in power every day. In a time like ours, so short of great men, the presence of such a man on our side amazes even our enemies. It is clear why Anglo-Saxon agitators spread their lies and slanders about the Führer and his work. They realize that his programs and aims are reaching the whole world, even their own nations. A nation has no greater possession than such a powerful, timeless personality who casts his spell on both friend and foe. Even some in Germany may complain that the Führer is totally absorbed in his work during the war, though it is the decisive factor in all that is happening. His behavior is in eloquent contrast to that of his counterparts with the enemy, who never miss an opportunity to stand in the spotlight. They apparently need that, perhaps because they sense that their lives and work will not last all that long. Men of real historical stature are above such behavior. They do not draw their strength from the changing applause of publicity, but rather from their historical mission which fulfills a higher law. We know of no great historical achievement that did not involve the hardest blows of fate. Indeed, the hardness and bitterness of the tests demonstrates their true worth. When we look back on the past two fearful winters when the Führer stood at the head of the army to meet and overcome an almost unconquerable fate, we remember Prussian-German history. He and we do not need to shy away from the comparison. The German people, betrayed by its entirely cowardly leadership in the late fall of 1918, became weak, and the hardest fate fell upon it. In the past two winters, however, the Führer and his people have proven that they are prepared to overcome historical failures and to pay the price of a great victory. It is not easy for me, in his fourth birthday of the war, to portray the personality of the Führer in its proper relationship to the sweeping events we are witnessing. He himself is entirely absorbed in his work, the end of which he foresees. Though we may sometimes regret his intense commitment, his modest style and nature bring him even closer to our hearts. In the great, breathtaking victorious phase of the war, we admired and honored him. Today we have learned to love him from the depths of our hearts as we have seen him overcome with bitter determination the hard and painful blows of fate. What a consolation it is for a nation to have as its leader a man who embodies for all an unshakable confidence in victory! He shows no trace of the chattering that our enemies love so much, but rather we see only a realism driven by deep fanaticism. Often in the course of this war people have praised the technical weapons and claimed that the final victory would be determined by the amount and quality of material. We do not want to underestimate their importance. Even more important, however, is the spiritual readiness of a warring nation to bear all, even the worst, rather than to bow to the strength of the enemy. The Führer embodies this attitude for us. Before he gave his all to the cause of peace; now he gives it all to the cause of war. He did not want war and did everything in his power to prevent it. Now that it has been forced upon him, he stands at the head of his people to wage it with every means. How often in the history of our movement have we seen him avoid a conflict that he thought unnecessary or harmful, but once it became unavoidable he fought to victory, whatever the obstacles. So it is today. We gather on the evening before his 54th birthday according to our custom. We do so as a united and determined nation, bring him greetings of honor, thankfulness, and every possible good wish for his person and for his historic mission. We do it this year with particular confidence. The danger that surrounds us has not weakened us, but rather made us fully alert. When a people must take the greatest risks to ensure its survival, it is well advised to banish the devils of doubt and discord so as to concentrate completely on its historical mission. It is not possible to make this clear in all its details to every citizen. It must therefore find expression in the will and the orders of the Führer. Confidence is the best moral weapon of war. When it begins to fail, the beginning of the end has arrived. No matter where we look, we see no cause for such concern. It exists only in the propaganda dreams of our enemy. The more hopes they put in the moral weakness of the German people, the greater will be their disappointment. The fact that we do not speak of Germanyâ€™s confidence every day is no reason to believe that it is absent. One usually does not need to talk about the obvious. If anything has become obvious to we Germans, it is the loyalty and absolute subordination of all at the front and at home to the man who embodies for us not only the German present, but also our expectations for Germanyâ€™s future. I say this in the name of the entire German people, the spokesman of whom I now feel myself more than ever to be. I say it in the name of millions of soldiers in every branch of the armed forces who are fulfilling their hard duty at the front, in the name of millions of workers, farmers and artists, of millions of women, who bear the difficulties of the war with patience and bravery, and in the name of the German youth, who bear his name with pride. As a nation of 90 million, we lay before him our faith. We believe in a German victory because we believe in him. Our good wishes for him rise from the deepest depths of our heart. God grant him health and strength and his grace. Loyally and faithfully we want to follow him wherever he may lead. He is our faith and our proud hope. We will walk firmly into the future his hand points toward. A people that calls such a leader its own, that follows him with such unconditional loyalty, is destined for greatness. It need only desire that greatness. We, the Führerâ€™s old fighting comrades gather around him now as always in the decisive moments of our struggle. We belong to him. We were the first he called. How often we walked with him through trials and dangers. At the end of the way was always the shining goal. So it is today. We never want to lose sight of it. With our gaze fixed on the goal we will fight and work on. We are the example of faith, of bravery, of unchanging conviction. We are the old guard of the party that never wavers. As the first soldiers of our people, our wish for the Führer on his birthday is the same one that has always moved our hearts. May he remain in the future what he is today and always will be: Our Hitler!